Name A Star Live makes you part of real space missions by launching your star name into space. As the holiday season is upon us, we thought we’d share some of the ways Christmas is celebrated in outer space. We even provide a futuristic, and amusing, look at Christmas through the vision of Star Trek! 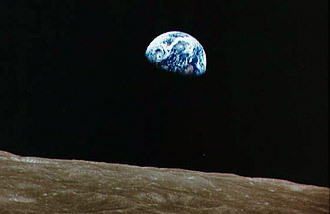 Earth as viewed by the crew of Apollo 8, December 1968. 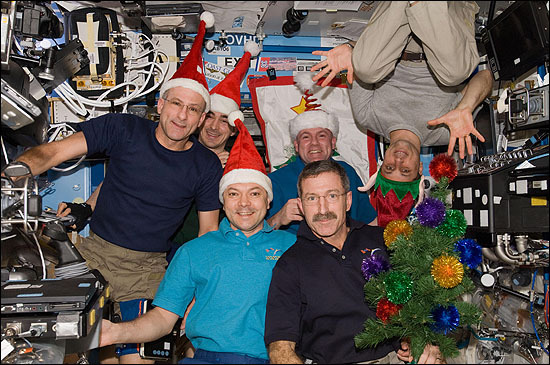 Click the image above to hear a recording of the astronauts delivering their Christmas Eve message to the world. 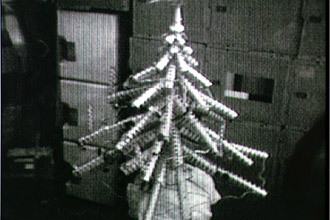 Perhaps the most famous celebration of Christmas in the final frontier occurred on the evening of December 24, 1968 when Apollo 8 Commander Frank Borman, Command Module Pilot Jim Lovell and Lunar Module Pilot William Anders became the first humans to orbit the Moon … and the first astronauts to spend Christmas in space. It is estimated that as many as one billion people watched the historic broadcast or listened on the radio. Listen to the message they delivered that Christmas Eve. It would be 22 years before another American would spend Christmas outside Earth’s atmosphere. Astronaut John Blaha celebrated the holiday in orbit aboard the Russian Mir space station in 1996. The first Space Shuttle mission to fly during Christmas was STS-103, on the Space Shuttle Discovery. The mission, which lasted from Dec. 19 to Dec. 27, 1999, gave NASA and the world a Christmas present that is still giving to the scientific community. After three consecutive days of spacewalks to make repairs and upgrades, they returned the Hubble Space Telescope to service on Christmas Day. Hubble had been in hibernation since the loss of its fourth gyroscope, designed to enable the telescope to point precisely at distant astronomical targets for scientific observations. 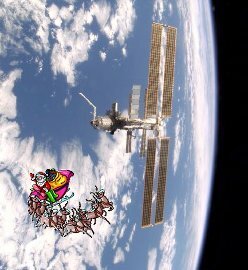 The first Christmas aboard the International Space Station (ISS) occurred in 2000 with the Expedition One crew. Astronaut Bill Shepherd and Cosmonauts Yuri Gidzenko and Sergei Krikalev spent a quiet Christmas Day opening gifts and talking to their families. As we look to the future, humans might one day celebrate the holidays on the Moon and Mars, in a free-floating space colony orbiting Jupiter, or in some other part of the Milky Way galaxy. But perhaps we should look to Star Trek for guidance — humorous guidance in this case!